Upshur County is a county located in the eastern part of the U.S. state of Texas. As of the 2010 census, the population was 39,309. The county seat is Gilmer. The county is named for Abel P. Upshur, who was U.S. Secretary of State during President John Tyler's administration. Upshur County is part of the Longview, Texas Metropolitan Statistical Area as well as the Longview–Marshall, TX Combined Statistical Area. Humans have inhabited what is now Upshur county since at least 10,000 years ago. The Caddoan people lived in this area, but were driven out about 1750, probably due to losses from new infectious diseases carried chronically by Europeans. Later some Cherokee migrated to the area from their territories in the Southeast - Georgia and Alabama. The Cherokee were driven out of here by European-American settlers in 1839, after having been removed from the Southeast. The first European-American settler in Upshur county was probably Isaac Moody, who settled there in 1836. Upshur County was named for Abel Parker Upshur, Secretary of State under John Tyler. Upshur County has the distinction of being the county that has the largest settlement in Texas organized by the Church of Jesus Christ of Latter-day Saints. In 1904 the Latter-day Saint South-western States Mission organized a colony at Kelsey, Texas. According to the U.S. Census Bureau, the county has a total area of 593 square miles (1,540 km2), of which 583 square miles (1,510 km2) is land and 9.7 square miles (25 km2) (1.6%) is water. As of the census of 2000, there were 35,291 people, 13,290 households, and 10,033 families residing in the county. The population density was 60 people per square mile (23/km²). There were 14,930 housing units at an average density of 25 per square mile (10/km²). The racial makeup of the county was 85.70% White, 10.15% Black or African American, 0.63% Native American, 0.18% Asian, 0.06% Pacific Islander, 2.10% from other races, and 1.17% from two or more races. 3.95% of the population were Hispanic or Latino of any race. There were 13,290 households out of which 33.50% had children under the age of 18 living with them, 60.70% were married couples living together, 11.00% had a female householder with no husband present, and 24.50% were non-families. 21.80% of all households were made up of individuals and 10.30% had someone living alone who was 65 years of age or older. The average household size was 2.62 and the average family size was 3.05. In the county, the population was spread out with 27.00% under the age of 18, 8.00% from 18 to 24, 26.60% from 25 to 44, 24.10% from 45 to 64, and 14.30% who were 65 years of age or older. The median age was 38 years. For every 100 females, there were 95.50 males. For every 100 females age 18 and over, there were 91.10 males. The median income for a household in the county was $33,347, and the median income for a family was $38,857. Males had a median income of $31,216 versus $20,528 for females. The per capita income for the county was $16,358. 14.90% of the population and 12.30% of families were below the poverty line. Out of the total population, 18.60% of those under the age of 18 and 14.00% of those 65 and older were living below the poverty line. Upshur County is represented in the Texas Senate by Republican Bryan Hughes, from Mineola. Upshur County is represented in the Texas House of Representatives by Republican Jay Dean, from Longview. 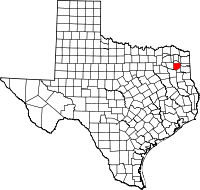 Upshur County, along with Marion County, is part of the 115th Judicial District of Texas. The presiding judge of the 115th Judicial District is Judge Dean Fowler. Prior to serving as judge of the 115th Judicial District, Fowler served as the Upshur County Judge from January 1, 2003 until December 31, 2018. Per the Texas Constitution of 1876, the chief administrative body of Upshur County is the five-member Upshur County Commissioners Court. The County Judge is elected separately. The county road maintenance is administrated by the County Road Administrator. This system was adopted in Upshur County in November 2002 and reaffirmed by two subsequent elections. The commissioners court oversees all of the Upshur County government's operations. Upshur County Judge Todd Tefteller began his first term on January 1, 2019. He presides over the Upshur County Criminal, Probate, Civil, and Commissioners Court. Commissioner Paula Gentry is in her second term and has served Precinct One since January 1, 2013. Commissioner Dustin Nicholson began his first term as Commissioner of Precinct Two on January 1, 2019. Commissioner Frank Berka is in his second term and has served Precinct Three since January 1, 2013. Commissioner Jay Miller began his first term as Commissioner of Precinct Four on January 1, 2019. The singer-songwriter Michelle Shocked, who grew up in Gilmer, refers to Upshur County in several of her songs. Author Edward Hancock II sets many of his stories in and around Upshur County, Texas.